Yadkin holds the distinction of being the most Republican county in the entire state. It gave 72% of the vote to John McCain in 2008, and Mitt Romney did even better, winning 75%. Part of the Foothills region, Yadkin is heavily white (95%) with no urban centers to speak of, contributing heavily to its deep red Republicanism. Yadkin is also a historically Republican county – in fact, Yadkin County and Republicans go way, way back, voting Republican for President in every election since 1868. Feelings of disconnection from the powerful, slaveholding eastern counties and a strong Quaker presence contributed to Yadkin being a hotbed of anti-Confederate politics, and after the war this shifted to support of the Republican Party. Hence, unlike most rural areas in the South, Yadkin never went through a realignment – the parties and their platforms changed, but Yadkin did not. 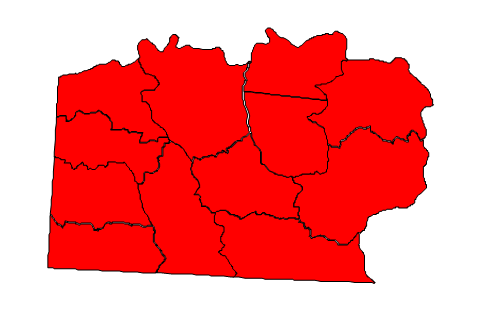 Thus, this is also one of the few counties in the United States to have never voted for a Democrat for President. Prognosis: Yadkin is as red as it ever was. The county growth rate from 2000 to 2010 was 5.7% (below average). Barring a massive realignment in the party system or sweeping demographic changes, Yadkin should continue to vote overwhelmingly Republican for the next 150 years.